I hate to type. I love land records. These two things do not go together. 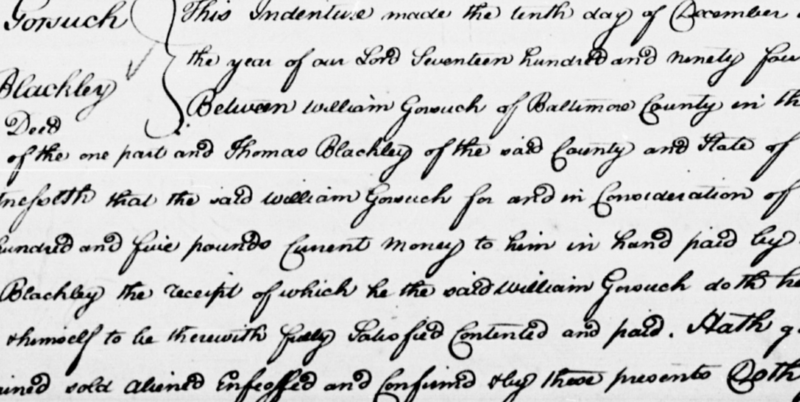 I have found so much great information in land records and I am lucky that many of the records I need are in Maryland. In Maryland, all verified land instrument records are on-line (and free) through MDLANDREC. All that is needed to access the records is a username and password, offered with a free registration. The problem with getting all these great records is that the older records are hand written. In general the copies are good, but they are tedious to read and even more tedious to transcribe, especially when you hate to type. So since I had some gift cards burning a hole in my pocket, and a bunch of records to transcribe, I decided to spring for Dragon NaturallySpeaking. I had heard some good things about the software and several administrative people in my office use it. After my purchase I installed it and have been using it for about a half an hour. So far I love it! In fact, I’m not typing this blog, I’m having Dragon do it for me. I was hesitant on buying a voice recognition program because I have problems with phone systems that can supposedly use verbal cues in their menus. But to this point I haven’t had any issues. During set up it had me read a few paragraphs of text so the software could learn my voice. Also, I have the TV on in the background and Dragon doesn’t seem to have an issue with picking up that noise. I still have a lot to learn about the software, but to be able to go from installation to using it successfully in ten minutes is awesome. I’m sure the cost of the software will be prohibitive for some, but for me the amount of time it’s going to save his worth that cost. I purchased the Premium version which is supposed to work with spreadsheets, so I may not even need to worry about using Google Forms any longer. Oh, and not only does this software type better than I do but it spells better than I do too! I have been doing a lot of newspaper research recently. I like to track what I find in a spreadsheet, it allows me to quickly sort my information and color-code cells for analyzing the data. The problem is I hate to fill out spreadsheets. I just don’t like the layout when typing in all the stuff I need to put in the spreadsheet. I use a lot of spreadsheets at work but I rarely create a spreadsheet from scratch. Usually my spreadsheets are created from some other application that “exports” to the spreadsheet format. I guess since that is what I am used to, that is what I like. Also at work I recently discovered Google Forms. I had to survey some of my co-workers and Google Forms was suggested as a way to create a quick, free survey. Once I create the survey in Google Forms I can send it to my co-workers and once they fill out and submit the form their responses are collected within a spreadsheet. As I was learning more about Google Forms I thought, “this may be a tool I can use for genealogy”. I started doing a little googling. I was sure I wasn’t the first person to come up with using Forms for genealogy. I stumbled upon a webinar that Thomas MacEntee did way back in 2011 for the Legacy Family Tree webinar series (Google Forms for Genealogists). I haven’t heard him really mention Google Forms recently, so maybe he isn’t using them as much as he was then. Some of the “quirks” he mentioned back then have been addressed in updates to the Forms app, some haven’t. But I think for my use it will be fine. Based on the type of news item I will then have different fields I want to collect. Once I figure out what fields I need on the form I will create the form. Since I will be the only one using it (for now) the form doesn’t need to be fancy. But it can be customized and themes assigned to the form if you want. Then when the form is designed I can start using it to collect my newspaper information. I’ll be experimenting a bit with my form and next time I will have more detailed instructions on the process of creating the form and using it. If this goes well I am thinking of using a form as a replacement for my vital records spreadsheet as well.